On Wednesday this week we celebrated Major's 51st birthday. We started with his favorite breakfast of French toast and then had Snicker cupcakes and then dinner of chicken friend steak and mashed potatoes and gravy! We celebrated with cake for all after Bible Study. Thursday the doctor was gone to Harare to get his certificates and so it was a very busy day for me. Lots of very sick patients and lots of procedures to do. I tapped fluid out of one man's lung and it was 6 liters! 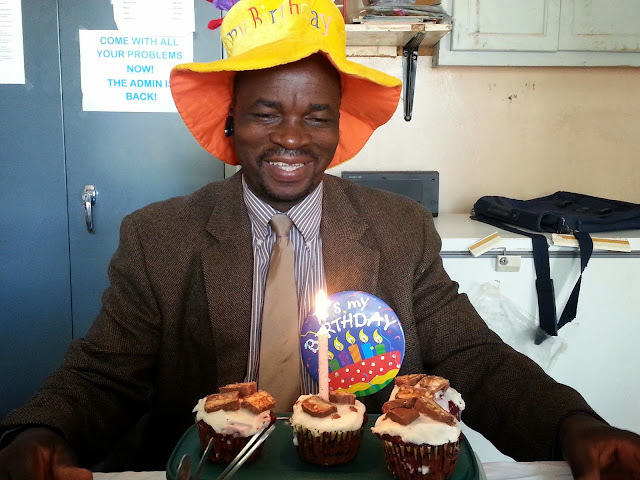 Thursday Fanny Nyamutora, a local young man who is now a minister in Gweru, came with a group of 10 from Mid-Atlantic Christian University in North Carolina. They spent 2 nights in his village home and they came to see the hospital and 2 went out on Immunization and ART clinic with our team. That night we had them over for a braii (BBQ). It was a quick visit, but it was nice meeting new people. Eye team, ZCC students, new doctor and new surgeon--life is good! On the 6th and 7th of May we had 2 eye nurses from Norton Eye Hospital who came to assess cataract patients. They had many people to see and they have chosen so many people to come back on the 25th of May to do the eye operations for 3 days. On the 8th of May our second group of Zimbabwe Christian College students came for their hospital visiting training. They spent until Monday with us and went out to preach on Sunday. They always say they enjoy this practical experience for future hospitals visits with people for their congregations. They graduate on June 6th so they are all excited about finishing their program. On March 27th I said goodbye to Samantha D'Andrea who had been with us for two months. She is hoping to pursue education to be a Physician's Assistant and we wish her well. She arrived back safely in Seattle. On Thursday this week we started a woman's conference for all of our 52 churches here at Chidamoyo. All of the women have been enjoying the lessons, the sermons, food and lots of singing and dancing and laughter. Great fellowship by all. It ends on Sunday after church. It looks like the church is very full so we think about 400+ women have come.